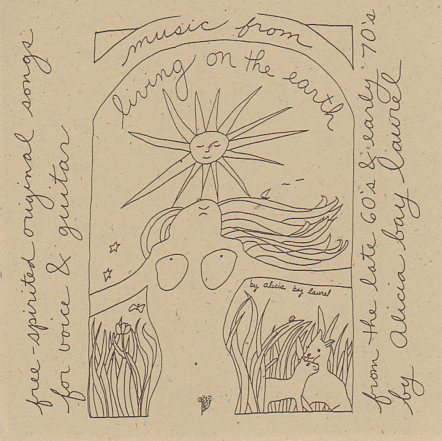 Posted on June 11, 2007 by Alicia Bay Laurel	in Blog and tagged travel diaries. 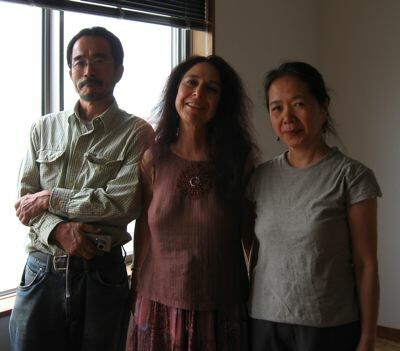 The next morning, Sachiho, Yoko, and Hiromi (Amana) and I awakened at the Yoshimori’s elegant house overlooking the bay in Karatsu, where we’d been brought by host himself after the party. He and his wife had spent the night at yet another of their homes, and the Amana ladies and I had this gorgeous, brand new house to ourselves. 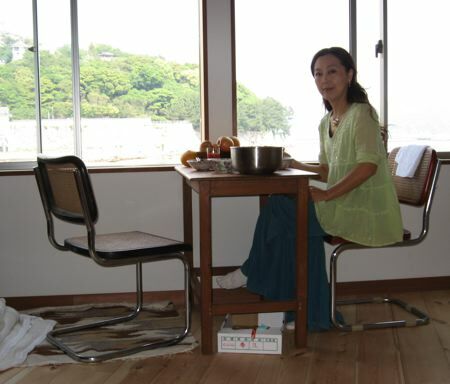 Yoko and Hiromi took an early plane back to Okinawa, and Sachiho and I had breakfast at a table with a splendid view. 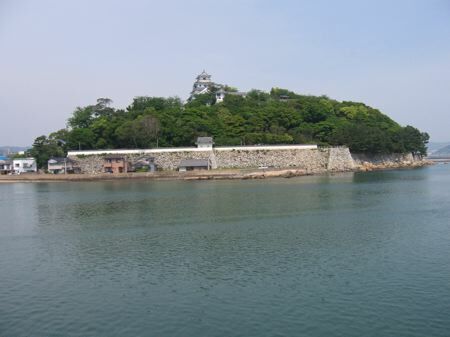 Right across the bay stood an old castle on a forested hill. 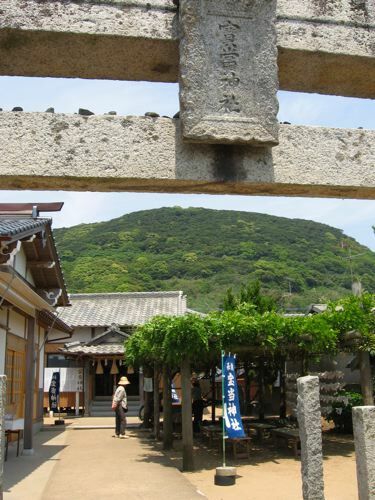 Karatsu lies at the westernmost point of Japan, and is the port through which Korean and Chinese people have visited and traded with Japan for centuries. 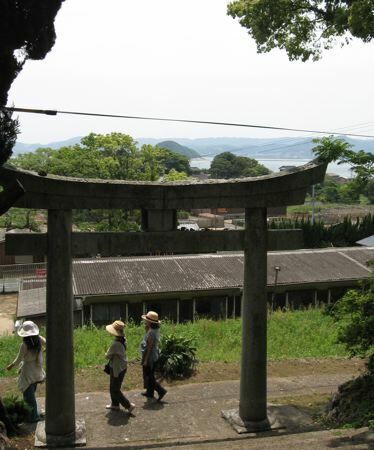 Yoshimori and his wife came over to see us after breakfast, and his wife took us out for a walk around Karatsu. 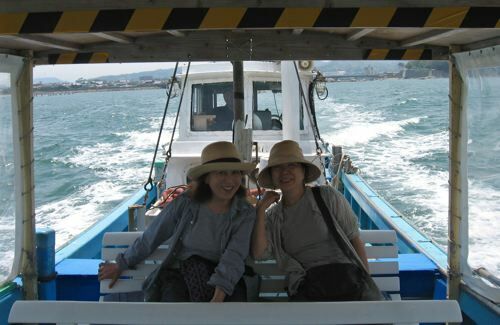 We were joined by her friend, a hat designer, and the two of them decided to treat me and Sachiho to a boat ride to Takashima island, home of the lottery shrine. 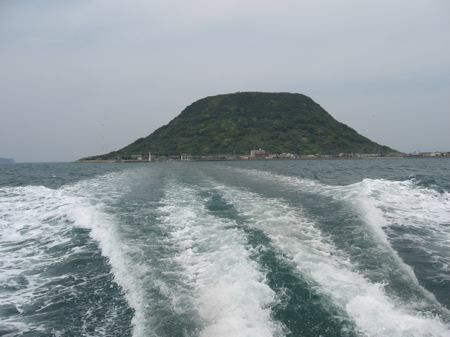 We passed the house where we had slept, which Yoshimori personally built, as we motored toward the island. It’s the second one from the left, light gray with a gray roof. 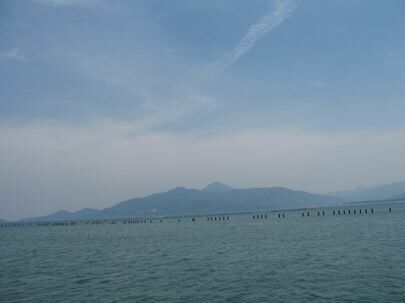 And we could see the mountains where their cabin is, at Saga, the site of last night’s concert. 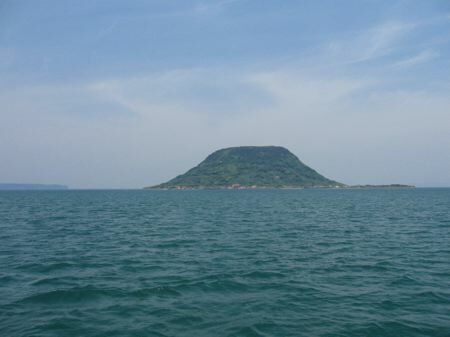 Takashima island has a mystical presence. We approach the harbor. 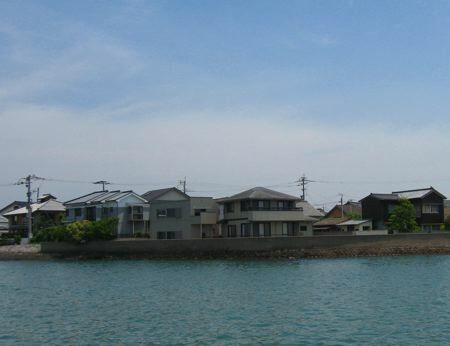 Most of the residents are fishing families. 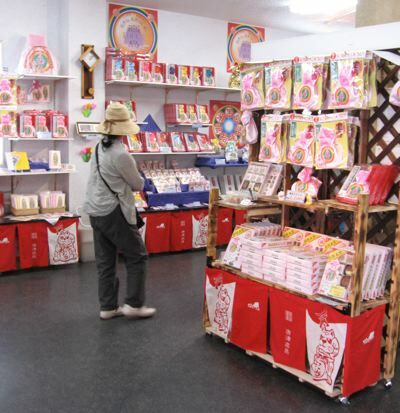 We walk up the quay toward a colorful shop. 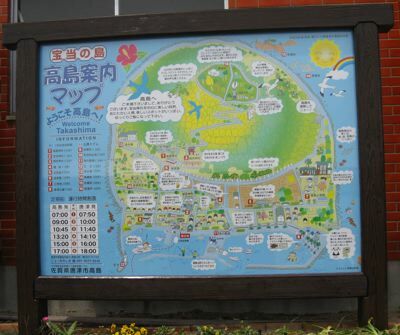 …and studied a map of Takashima outside the general store. 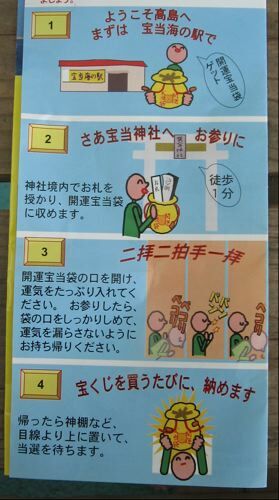 …that explained clearly how to win the lottery. 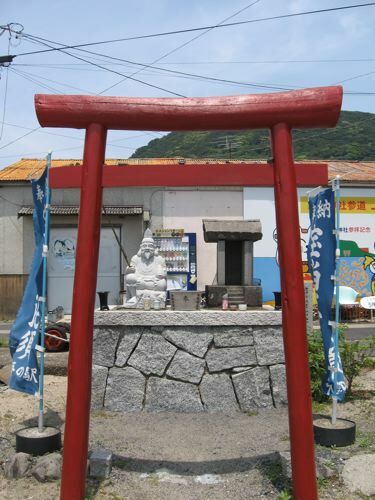 Here’s as close as you can get to the lottery shrine with a camera. We went in and thanked the Great Spirit for the amazing good fortune we already enjoy in our lives. 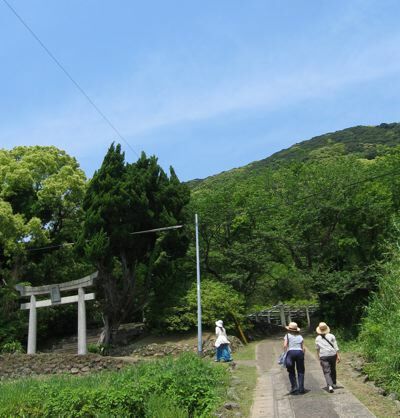 After we left the lottery shrine, Sachiho lead us to another shrine higher up on the mountain. She’d been here before. 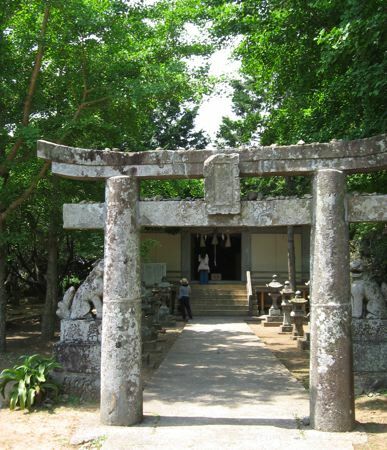 At this shrine we also said thank you to the Divine Spirit. 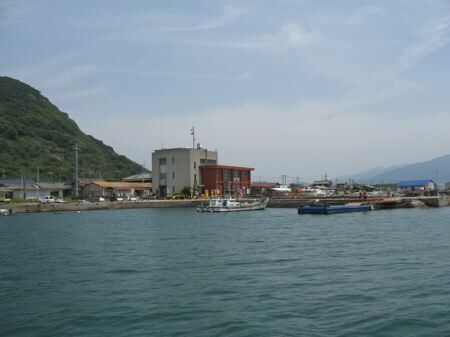 Then we headed back to the harbor, well pleased with our journey. 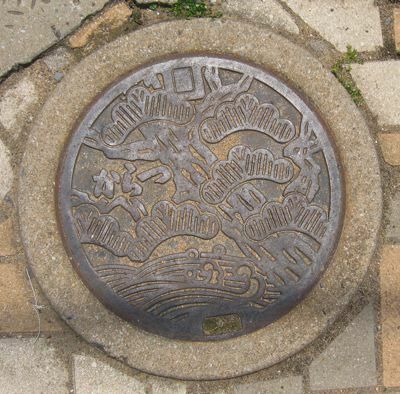 Of course, I had to photo the Takashima man hole cover for my collection. 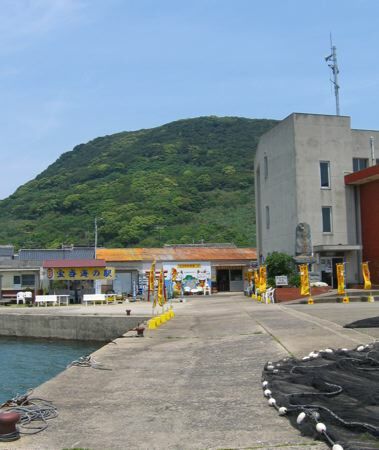 Then we sped back to Karatsu to tour the clothing store, ship my suitcase to Osaka, and catch a bus to the bullet train (shinkansen) to Yamaguchi. We just barely made it.